With ASM-300 up to three different receiving antennas from 9 kHz - 300 MHz can be switched loss-free to one output. The HF-inputs have BNC connectors and are protected against short and pulse-shaped voltage surges with complex ESD protection circuits. The unit is supplied via USB, no additional power supply required, which make the ASM300 ideal for portable operation also. The switches are driven by software which is included, as well as a standard USB cable. This combiner is not suited for transmit mode. The antenna splitter ASA-15 distributes the signal of one receiving antenna to up to five receivers. Each of the five outputs has an individually selectable wideband amplifier with 12 dB gain. Further a 15dB attenuator is integrated in the input to reduce strong signals. The internal distribution is done with low noise amplifiers, preventing mutual influence of the outputs on each other. The selected configuration is shown with LEDs on the front panel. A power supply (12V/1A) is included. With the ASA-42 antenna distributor the signal of four receiving antennas can be distributed to up to two receivers. 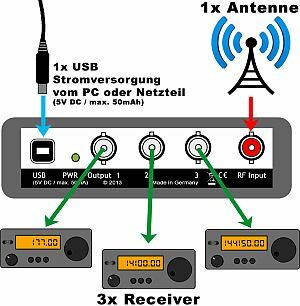 The mutual influence of the receivers is reduced with wideband amplifiers, allowing to use multiple receivers on the same antenna. The selected configuration is displayed with LEDs on the front panel. A power supply (12V/1A) is included. This distributor is not suitable for transmitting. Serves to connect two antennas to one receiver or vice versa - one antenna to two receivers. This device contains a wideband transformation network which combines both inputs and transforms the impedance. Further this networks isolates both inputs against each other. The insertion loss up to 200MHz is less or equal than 0.8dB, isolation between both inputs is 30dB (@3-200MHz). Due to the high isolation between the two inputs the SS-500 can combine any two antennas, also with different frequency ranges, without one antenna shortening the other antenna. 50 Ω impedance, SWR better than 2:1, Size 80x60x30mm, Connector 3x PL female. This splitter/combiner is not suitable for transmission. To connect an ADS-B receiver with a wideband scanner or a flight radio receiver to a common antenna. The Splitter has two Outputs, one for a ADSB-Receiver (Radarbox, SBS-3 etc.) and one more for 1,6-400 MHz, to any other receiver or scanner. The integrated circuit ensures that the two outputs are combined to a correct impedance, on the other side to avoid influencing each other are isolated. The insertion loss is max. 0,5 dB, the Isolation between the 2 connectors is minimum 45 dB. 50 Ω Impedance, SWR better 2:1, Size 80x60x30mm, Connector PL. This splitter/combiner is not suitable for transmission.